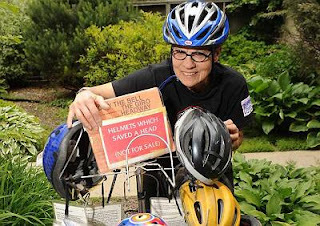 Chicago's "Helmet Lady," Kathy Schubert of the Lincoln Park neighborhood has made it her personal mission to preach the practice of bicyclists wearing a helmet. (Read the June 8th Sun-Times article here). The "Helmet Lady" is also an artist of sorts who has compiled a "Helmets that Saved Lives" website. This website shows photographs from riders who were involved in a bike accident and their helmet prevented injury by absorbing the impact. Best of all, the website shares the stories of the riders who were saved by their helmets. These stories involve individuals as disparate as weekend warriors and Lance Armstrong. Illinois law does not require bicyclists to wear helmets. However, it is entirely possible that legislation could be enacted in Illinois. Within the past couple of years Illinois cyclists have seen changes in the Rules of the Road related to how to properly signal a turn, the lights required on a bicycle, and rights of bicyclists on the road. These legal changes demonstrate that the Illinois legislature (and local municipalities) are paying attention to bicyclists as the numbers of riders increase. Motorcycle riders throughout the United States saw an increase in legislation requiring them to wear a helmet for their own safety, and to reduce the medical care costs incurred by the States when uninsured riders needed medical care that would have been prevented by a helmet. If there is an increase in uninsured riders who suffer serious (and expensive) injuries while riding, it could be only a matter of time before bicyclists are required to wear a helmet. There is no disputing the effectiveness of a bicycle helmet in preventing injury. There is an urban legend that helmets can cause an injury because of its awkward design. This is false and based on shoddy and unreliable science. To read a more reliable and scientific study see this New England Journal of Medicine study that concluded that bicycle helmets have a 85-89% effectiveness in reducing brain injuries, especially in children. Then again, don't just trust the New England Journal of Medicine. Just ask the "Helmet Lady" or any of the riders who wrote her detailing how their helmet saved their head.